Antlers in Design – Love ’em or Leave ’em? I don’t know about you, but I think we need to tell Bambi to go find a good hiding place, and quick! 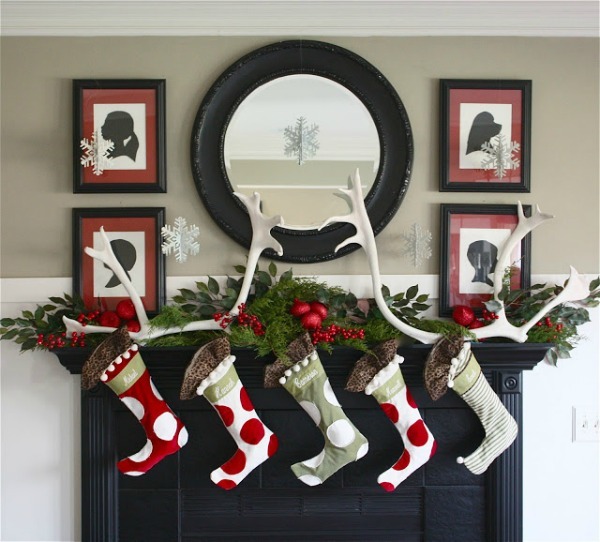 If you follow along with me on Facebook, then you surely saw my opinion poll on decorating with antlers. Opinions were nothing y’all were short of, concerning the matter for sure! Wow, who knew antlers would be such a hot topic! The results were interesting, it was about 50/50 on those of you who love Antlers in Design and those of you who hate it. I have a strong suspicion too that the acceptance of antlers in design is also based on where hunting is geographically and culturally embraced vs. more urban areas. 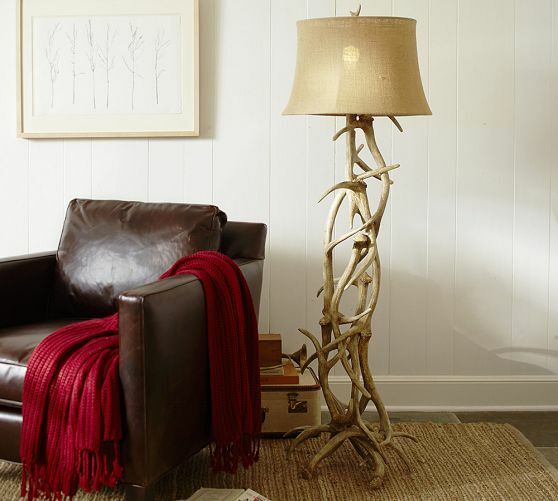 Turn a few ginormous antlers into a wall sconce flanking a fireplace. This room is gorgeous! 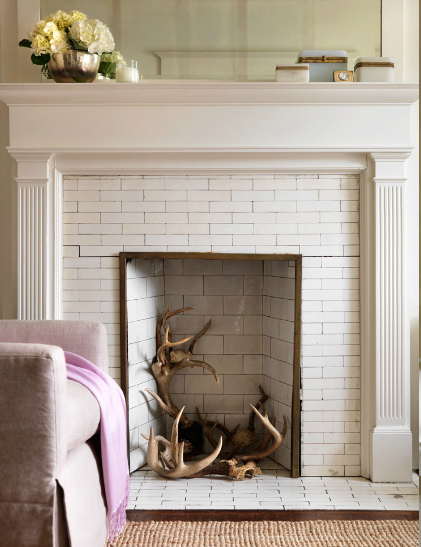 Consider filling an unused fireplace with several antlers in place of wood. The free flowing shape of the antlers almost mimic the movement of flames. Very creative indeed! Two of my girlfriends run the very fun blog Love, Feast, Table and they sell all those gorgeous velvet pumpkins you see across the blogisphere! 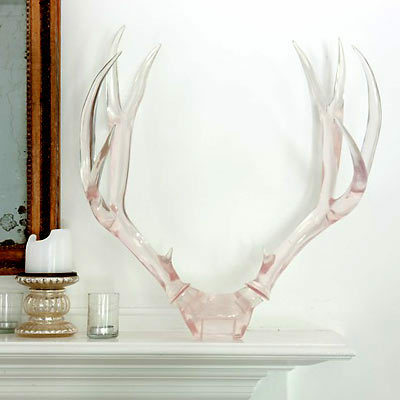 Their shop also sells these very modern, clear with a hint of pink, antlers. 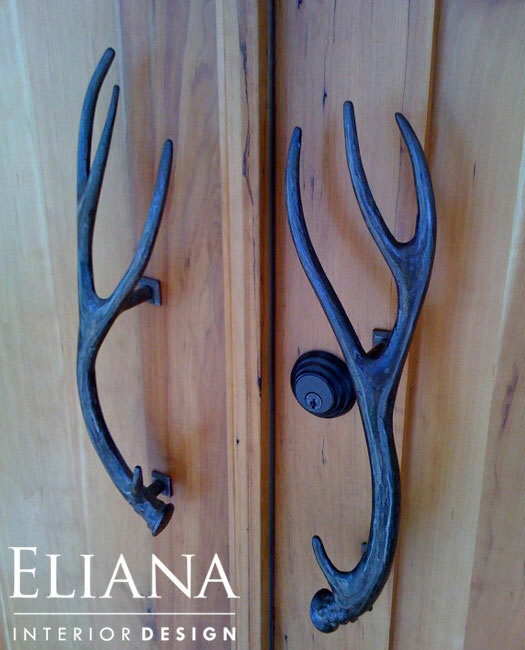 If you are avoiding decorating with real animal antlers then these could be a fun, chic, and eclectic option for you! I love these! I just need them in a tint of blue… (hint, hint Chris Ann!). 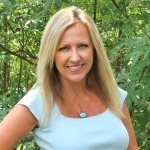 My sweet friend Sarah from the Yellow Cape Cod is an amazing interior designer and she has certainly made antlers (faux and painted) look absolutely amazing in her and her client’s homes. Customized antler front door hardware (in cobalt blue even!) embraces the true definition of rustic-chic design! Pottery Barn has exploded in Bambi love this fall! They have over 14 different accessories made from faux antlers. Um, I think if Pottery Barn is focusing on it, then it’s safe to say that antlers have hit mainstream. Nester can’t seem to do anything wrong… sigh… love! She’s always spot on with decor, color and design in my humble opinion. So please weigh in on the debate! 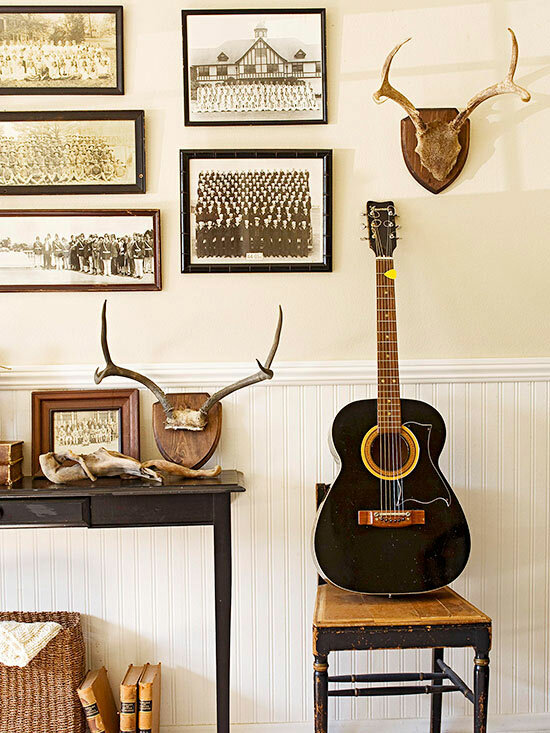 Do you love antlers (faux or real) in home decor or do they gross you out? Are you slowly warming up to the style (I’d say trend, but after a consistent 6-7 years, it might go beyond a trend). Give your opinion! This is a no-judging-safe-zone of opinions (as always, please keep it civil, fair, and polite). Love the antler door handles!!! The reason I’m not a fan is that I grew up with a house full of antlers and taxidermy animals, and it was just too dead animal house for me. 🙂 So now that I’m an adult and I see antlers it just reminds me of bad design choices by my parents. Interesting! My grandparents lived in the country where there were a lot of deer and elk so I’d find antlers on the ground now and then after the males shed them. I loved how they looked and I loved the idea of having something from these gorgeous creatures. A few years ago I showed a friend a chandelier I had made of antlers. She was horrified because she thought this was made from antlers from deer that had been killed. She didn’t know they shed their antlers every year. I can totally see how it would be distasteful to someone who sees antlers as a symbol of hunting. I think of those cold, crisp days when I was out collecting rocks, cool sticks, and finding antlers from the beautiful deer I might be lucky enough to see. The shedding of antlers naturally is how nature works! Every other person on my block owns guns and hunts. This is our culture, and the way of life that has existed for millennial. I too embrace the use of natural elements in decor in every option possible. The only design issue I have a problem with is when it’s on the dinner table. It’s just a tad unappealing to me, what do you think? I’m curious. I can see how that would be unappealing. If they weren’t really cleaned up and almost polished, I probably wouldn’t put them on the table either. But I don’t like a lot of elements from nature on my table if they are kind of messy. Some pine greens are a good example because you know how those needles get around. Actually, when it comes to the dinner table, I guess I’m all business because I prefer to keep the decorations to a real minimum during meals. Candles and flowers. The rest is decoration for between meals. I’m with Brandi though, if they weren’t faux or naturally shed, I prefer the found method of acquiring antlers. I like them (and I prefer real), but I had really felt like they would be a fad, and I would get a bunch, and then would be stuck with them. I didn’t know the trend had been around that long already though. I live in N. MN and we hunt deer all the time. Mostly I have just seen the “whole deer head” mount on the wall and I don’t like that. I prefer just the horns. I do have 1 elk shed that i bought at an auction that I like and it lives on top of a hutch. I don’t really like them but I see nothing wrong with it if that’s what you like. I do have some in my decor though – antlers my dad found when I was a little girl. He hung them on our front porch. When my mom sold the house I brought them home & now they’re in my wooden dough bowl(another family heirloom hand carved by my great-grandfather!) along with other nature objects. I only like to see them because they remind me of my dad. I don’t think I’d ever mount any on the wall. Well, I have to weigh in that it’s not really my thing, altho I do love bringing a touch of nature in to the home. I guess if you had some that had sentimental value…of course, hubby has some cow skulls on the backyard fence….so…to each his own! Not a fan. However, I like the ones in the Christmas picture above. I think they are beautiful and add a nice natural touch,.they shed their antlers so no need to kill for them!! I think they add a wonderful rustic touch to home décor. The lamp is so pretty and understated, love it! They’re so pretty piled in a basket, but I don’t care for them on the wall. That said, I don’t think those pink ones are for me, sorry. My husband is a deer hunter…he doesn’t do the trophy head thing. His deer turn into wonderful smoked sausage and believe me, deer sausage is heavenly in gumbo and other dishes. I wish people wouldn’t judge hunters who hunt responsibly and lawfully. Unless you’re vegan, your meat and/or fish do from a creature that was once living. I have a few antlers lying around, but I live in the woods, and the contributors are right outside the windows. However, we also have horses and chickens and you will NEVER find burlap in my house…..or chevron for that matter. Antlers? No way. I’m with you, Kim, in that a nice piece of driftwood would do very nicely. 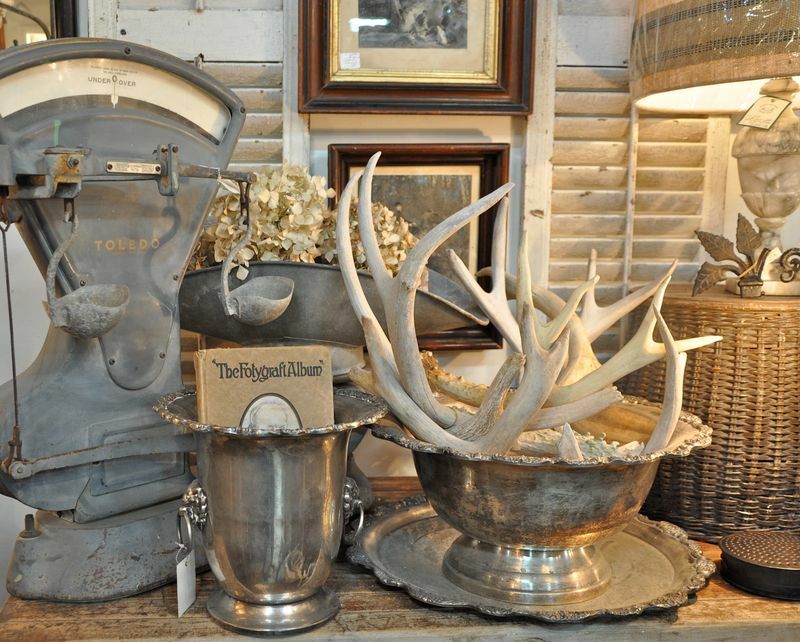 I’ve been in love with antlers & taxidermy for years….but in small doses. The faux heads and horns make the look more palatable for us animal lovers. I live by the beach and prefer never to see another piece of driftwood in my life. The examples you provided are both clever and accessible. I vote yea! I love the antlers. I have been meaning to get a few extra from my brother-in-law who is an avid (responsible) deer hunter. We have deer all around our farm but don’t hunt them. I keep hoping I’ll find some shed antlers but not yet. I have seen one blog where she made her own out of clay and they turned out so realistic. I wouldn’t mount them on the wall but do like most of the examples you shared! I live in Texas Hill Country, an area where deer are hated and loved. I must say that you don’t have to think of “dead animals” when you see antlers. Bucks lose their antlers all the time in our area. It is not uncommon to find them on the ground. I personally did not have any until recently I came across a huge yard sale where a store owner had closed her shop and had everything down the street from our home. I purchased a pair of antler candlesticks (marked pair for $90) for $10! I love them in my Fall Decor!! Thanks for a great website, love it! Sorry but I say they’re great! It’s nature and certainly better than supporting sweat shops overseas for frivolous decor! Deer are part of the food chain. At least it’s not supporting the cruel storage of animals in small cages never to move so we can fill them with steroids and antibiotics for our food source. I like the shabby chic look of antlers in small doses. My boys reuse theirs for all sorts of clever ideas… We call it recycling. Great ideas!